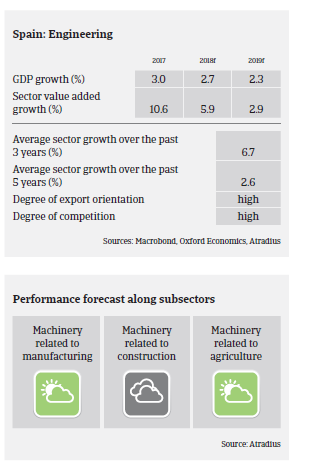 The Spanish machinery sector has been growing both in turnover and margins over the past five years, and this favorable evolution has significantly contributed to the rebound of the Spanish economy. Machines/engineering is one of Spain´s major export sectors, delivering 70% of its production to markets abroad. In the machinery for manufacturing/machine tools segment Spain is the third-largest producer in the EU and the ninth-largest in the world. The main buyer sector is the automotive industry - one of the main sectors of the Spanish economy, with a high volume of investment. The EU is by far the main destination for Spanish machinery exports. Quality and price are key in this very competitive market with many active players, both of which are putting pressure on businesses margins. Many Spanish machinery businesses compete in technology segments with lower added value. Machinery output is expected to increase 3%-3.5% in 2018 because the flexibility of the production processes facilitates adapting to changing market demands. However, due to its high export ratio the industry is very susceptible to external risks (deterioration in the Eurozone, Brexit impact, oil price volatility, rising protectionism). Profit margins are expected to remain stable in the short-term, while access to bank loans is generally open. Payments in the machinery sector take between 60 days and 90 days on average. Payment experience has been rather good over the past two years. No increase in payment delays or insolvencies is expected in the coming 12 months, due to order backlogs and further economic growth in Spain and the EU. Our underwriting stance is generally open for the manufacturing-related machinery segment, due to steady revenue growth and a benign outlook. The same accounts for agricultural/food machinery, which benefits from the robust performance of the large Spanish agriculture and food industry. Our underwriting stance remains neutral for construction-related machinery. This segment has benefited from construction growth in Spain (construction output increased 3.2% in 2017), but remains susceptible to a potential reversal of the still wobbly recovery of the building industry. We are also more neutral when underwriting businesses dependent on the oil/gas industry, as machinery investments are highly susceptible to commodity price volatility.